I’m a huge fan of walking while working. 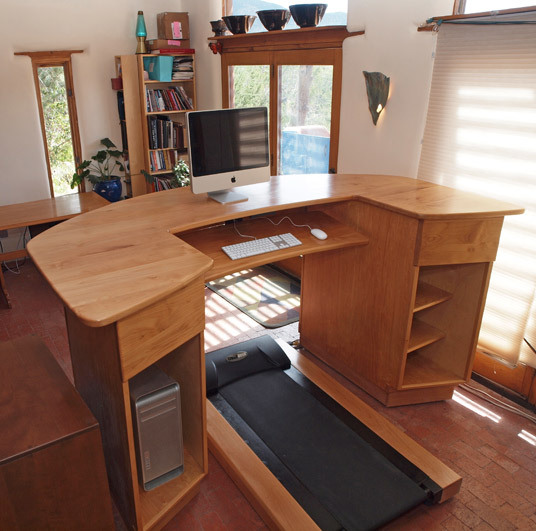 In 2011, I installed a treadmill under my desk and now I walk an average of 20 miles a week while programming, emailing, and talking on the phone as usual. I’m amazed (and a little discouraged) to realize that I may very well have spent the majority of my waking life in front of a computer monitor. Ever since I started programming a Commodore 64 computer back in the 4th grade, almost every facet of my education, work, and entertainment has involved computers. I did some quick math and estimated that over the last 30 years, I’ve spent over 60,000 hours in front of a computer working, playing, and making music. As such, it came as no surprise when I started gaining weight and generally feeling sluggish as I rounded year 38. I didn’t seem to have the time or motivation to add an exercise routine into my fairly crazed schedule… but what if I could walk five miles a day without leaving my desk? On a typical day at my home office, I spend half the day sitting and half the day walking 1.5 MPH on the treadmill. This burns up 650 calories per day without me changing my routine at all. Every week I’ll walk about 15 or 20 miles. By 2017, I’d walked over 3,200 miles. This practice has fundamentally transformed my life. I’ve lost weight, and I sleep better at night. At work, I’m more energized and alert. Moreover, I honestly believe that when I’m walking I’m thinking in a different (and better) way than when I’m sitting. Maybe it’s something to do with how walking while solving programming problems necessarily involves cooperative activity in both halves of my brain? I’m not sure why, but for whatever reason I know for a fact that my body and mind are simply working better now that that I enjoy walking as an integrated part of my work and play. Love the concept but what I’d really like to know is where you got the desk. I’m looking for a stand up unit but hate the standard “table” options out there. This is much more my style and what I’m looking for. Any insight is appreciated! Hey Jim, I had a woodworker friend of mine build this for me to my specifications.